Good manners in this country demand masks for any cold symptom. Parents get their children used to wearing them by pre-school. 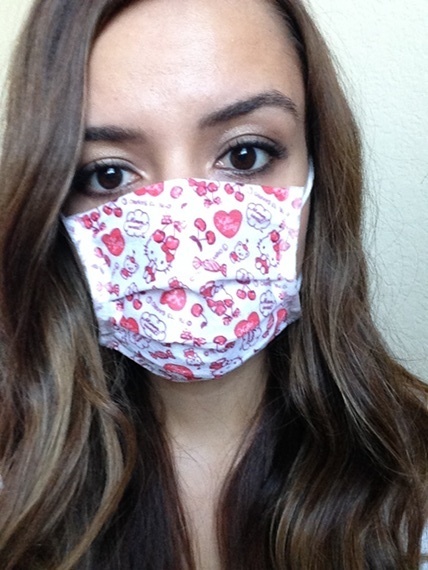 Wearing gauze masks during cold and flu season is not a trend in Japan. It is a national mania. Every drugstore, supermarket and convenience store across the country stocks small, pleated, gauze masks that stay in place with little string loops over each ear. I want to know which mask is from the empty rack! That's the one I want. Rose scented masks, character masks, masks for children, masks for babies, scary masks, pastel masks, patterned masks, sleep masks, whatever the public's germaphobe heart desires. Scented masks are a new trend with women. Japanese have covered up for decades during cold and flu season. Crammed onto commuter trains, subways and buses, your cough is in someone else's face - literally. Good manners in this country demand masks for any cold symptom. Parents get their children used to wearing them by pre-school. These mini-masks are scaled for three- to six-year olds. People drive with their masks on. Which is, I admit, sort of weird. Germaphobia is pretty normal here. The average Japanese goes to the doctor thirteen or fourteen times a year. Signs in bathrooms and PSA's on TV warning to gargle and wash your hands are inescapable. Shopping malls and many department stores have hand sanitizers at every entrance. Chinese have embraced the gauze mask trend, too. Especially in Shanghai and Beijing where pollution levels have soared to unprecedented levels. Most people go through a lot of masks in one winter. So much so, that they're sold in bulk. A box of sixty masks at this drugstores sells for 480 yen ($4.50). Most new masks have thin, flexible plastic filaments at the top to adjust for a comfortable fit. One of the newest lines for women promises not to smear your makeup. Make-up safe mask in baby pink. Hello Kitty, Disney, and popular anime characters fight viruses and germs with the power of kawaii (cute). If you aren't coming to Japan, online sites carry a variety of imported fashionable, scary, and silly masks. Though at a much inflated price. A package of five plain masks or three character masks can be had for as little as a dollar in Japan. These character masks are from the 100 yen store. Foreigners used to laugh at the asian devotion to gauze. With air travel shrinking the world, headlines shouting 'plague' in big bold type, and worries over airborne viruses (I'm not talking about you, Ebola! You are not airborne.) suddenly the phenomenon doesn't seem quite so silly. In fact it looks quite practical. I recently had to fly from Tokyo to Europe with a bad cold and cough. I kept a mask on for most of the flight for my seat neighbors' peace of mind. Although the hacking was still totally annoying. (Sorry!) Masks are a great way to keep your nose and throat moist in that hyper-dry airplane air. Peace fellow passengers. I mean you no harm. Masks serve an important secondary purpose in this part of the world as paparazzi camouflage. Celebrities routinely don them for shopping trips in their neighborhood. The standard costume is plain white mask, oversized sunglasses and baseball cap or hoodie. This mask is designed to ease sore throats. Japan is more than ready for the brave new world of hitchhiking viruses. Just remember, although it's okay to wear them almost anywhere in this country, I'd be a lot more cautious in the U.S. You don't want to be mistaken for a robber. Don't make it weird.